Russian photographers and engineers were at the forefront of developing cameras that allowed the photographing of troop movements and terrain from above. While ordinary travelers in the 19th century still trusted in age-old means of navigation, the situation was different for armies. Because of the increasing range of artillery and the growing mobility of forces, existing navigational resources came up short. Although photographic science was still in its infancy, enthusiasts came up with the idea of photographing the Earth from above using balloons and kites. The first aerial photographs were taken over Paris in 1858 by French photographer and balloonist Gaspard- Félix Tournachon. In Russia, aerial photography was pioneered by Lieutenant Alexander Kovanko and Dmitry Mendeleev, the scientist better known for creating the periodic table. In 1885, they set up a park for training army officers in aeronautics and aerial photography. Another enthusiast of the 1890s, Captain Sergei Ulyanin, developed box-shaped kites especially for photography. Ulyanin’s 19th century “drones” could carry a camera either as it went aloft or be the receptacle for one sent up the string on a small cart once the kite was airborne. However, it quickly became clear that existing cameras could not produce the desired images due to their limited viewing angle. Russian engineer Richard Thiele (sometimes written Tile), who was working on railroad construction, addressed the problem with a multiple camera set-up. He had already been developing a similar system to take panorama shots along proposed rail routes. His 1898 seven-chamber “panoramograph” consisted of six cameras arranged around a central one that photographed the skyline. The surrounding cameras provided fiducial (reference) marks that allowed the exact positioning of images by location and create an orthogonal plan that minutely preserved length and distance of the recorded landscapes. The camera used an electronic leveling device to activate the shutters as soon as they were positioned absolutely horizontally. The main client for such aerial surveys was the military. During the Russo-Japanese War of 1904-1905, three specialized aerial battalions were already using tethered balloons and Ulyanin-type kites for reconnaissance and photographic mapping of terrain. By the 1920s, aircraft were getting in on the game. However, since airplanes were still very basic in their capabilities, planes only gradually replaced kites and balloons. But they immediately attracted aerial photography enthusiasts with their potential. It was the emerging combination of camera and plane that resulted in full-fledged aerial photography. Within a few years, the technical discoveries of the previous decades culminated in new generations of cameras specifically designed for aerial use and the more complex reconnaissance that became necessary with the outbreak of World War I in 1914. Because of the work of military engineer Colonel V. Potte, Russia was already well prepared for these developments. 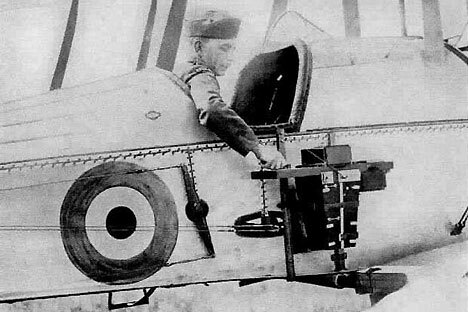 In 1911, Potte created a semi-automatic camera for aerial photography. His camera consisted of a wooden box with a front bevel that held a camera and lens with a 210mm focal length and 1:4.5 aperture. The camera featured a winding mechanism that activated the shutter by means of a rubber bulb that would expand and pump air as it gained altitude. With no separate reloading required after each shot, the machine could make 50 successive 13 x 18cm images while mounted on an aircraft. The design was so successful that the resulting photographs could also be used for precise topographic maps. Potte’s camera was used through the 1920s, and served as the basis for a night-shot camera designed in 1930. Sergei Ulyanin had also invented a type of aerial camera that was built specifically for aircraft and was ideal for military use. The camera had a pneumatic altimeter and a clock that time-coded the 13x13cm images. However, unlike Potte’s model, it was not automatic and had to be operated manually from the aircraft. World War I was fought primarily through trench warfare, fortified positions and heavy artillery exchanges. Determining the coordinates of enemy forces was essential, and aerial photography helped give armies an edge on the battlefield. But the aircraft had to fly low to get good pictures – at only about 5,000 feet – and since these planes were not armored, their pilots regularly risked their lives to obtain accurate data. As the Russian Army advanced in Galicia (in present-day Ukraine) at the start of the war, aerial cameras were instrumental in storming fortress cities. On Dec. 2, 1914, Lieutenant N. Mulko swept unexpectedly over the enemy guns at a “negligible height” to get photos of the reinforcements around the Austrian fortress of Przemysl, according to military reports. This enabled the effective targeting of the fortress with accompanying photos of its bombardment. By April 1917, a total of 198 Russian planes had been fitted with the Potte camera and 77 with Ulyanin’s design. Another 114 carried other camera types. Around 1.5 million aerial photographs were taken by Russian forces during the war. Despite the upheavals of the 1917 Revolution, aerial photography continued to develop at a fast pace in Russia and the Soviet Union. By 1931, the Soviet Union had already outpaced the rest of Europe in the amount of its territory that had been photographed from the skies.